New Video: 3M & Marian - Marian, Inc.
Marian’s supplier partner, 3M, produced this video which narrates how 3M and Marian partnered to seamlessly deliver solutions to Nebia during the design of their innovative Nebia Spa Shower. Marian and 3M worked together to suggest materials and ultimately provide samples of 3M™ VHB™ in various thicknesses and sizes. Marian manufactured prototypes rapidly for testing and evaluation. The collaboration and strong level of trust between 3M and Marian proves to be a winning combination where the end user reaps the benefits. Marian is proud to have a long-standing history of partnering with 3M, one of the world’s leading material suppliers. 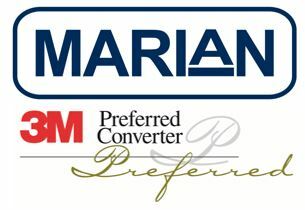 Marian has been a 3M™ Preferred Converter for 20+ years. A Marian representative has served on the 3M™ Preferred Converter Advisory Council since the 1990’s. The high level of partnership and collaboration is incomparable. Contact us to bring in 3M and Marian to support your next design.